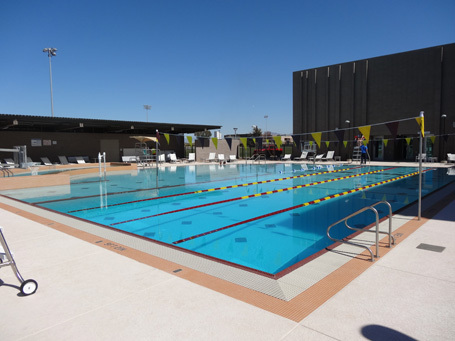 In January 2013, Arizona State University celebrated the grand opening of its long-awaited Sun Devil Fitness Complex on its Polytechnic Campus in Mesa, Arizona. The $19 million, 62,000 sq. ft. recreation facility was designed by Architekton and 360 Architecture along with the aquatics expertise of Counsilman-Hunsaker. The facility houses an outdoor state-of-the-art swimming pool for fitness lap swimming, recreation and relaxation. Other amenities include a weight and fitness area, various courts for basketball, volleyball, tennis, racquetball and sand volleyball, soccer and softball fields as well as group fitness classrooms. Students on the Polytechnic campus played a significant role in the design of the facility, creating a space that not only promotes health and wellness, but also fosters a greater sense of community. This hands-on approach is representative of the project-based learning that students at Polytechnic experience inside the classroom.